Sepak Takraw Season is Here ... Check out our NEW INITIATIVE! Contact us about our NEW 'AFTER SCHOOL COMMUNITY PROGRAMS INITIATIVE', accessible to all Members for just $195.00! ... and no more MAP Grant to have to go through. Summer Job Opportunity - Apply NOW! 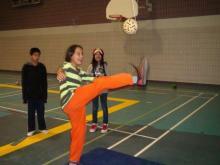 In preparing for hosting the First Annual Northern District Championships that took place on Dec. 6, 2012 in La Ronge, Senator Myles Venne School (SMV), the host school, had all grades from JHS and up practicing hard in their Phys. Ed. program. It paid off, as the Gold medal in each division went to SMV teams ... although the boys from one of the top-rated Weyakwin Youth Teams played ended up playing in the HS Boys division and still won Bronze. 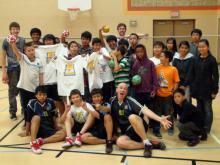 Other teams competing were from Beauval, Southend and Churchill HS (also in La Ronge). 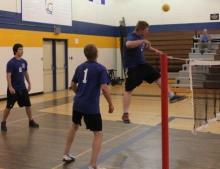 As we move forward into 2013, STAS was really excited that Saskatoon's Star Phoenix Newspaper reporter stated that his favorite story of 2012 was covering the Sepak Takraw Provincial Championships hosted at Saskatoon Christian school at the end of May. Why not 'get your kicks' and make headlines in your community in 2013? Grants/Free Clinics: Click here to view all the details! 2012 Cdn. Open: Congrats Regina Club Teams! 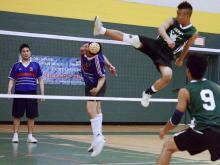 Regina Sepak Takraw Club teams swept medals but one in the 2012 Canadian Open Sepak Takraw Championships this summer. Click HERE to view some of the awesome 2012 Cdn Open photos! 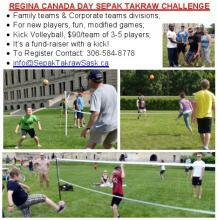 Regina Canada Day Corporate & Family Challenge! IT WILL BE THE MOST FUN YOU'VE HAD ON CANADA DAY!